Don’t let the crisp autumn air, the beautiful fall foliage, or the season of pumpkin-spice everything fool you. 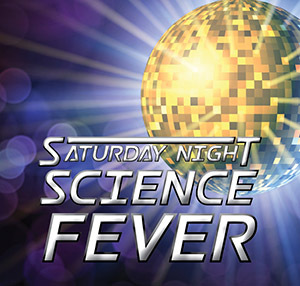 Things are going to get Hot, Hot, Hot when night falls and the Connecticut Science Center (CSC) opens its doors and welcomes you to Saturday Night Science Fever: New England Style! Under the harvest moon you’ll Hustle over from your Hotel/Motel/Holiday Inn and Boogie Oogie Oogie your way through all the exhibit galleries on all three levels. In each gallery you’ll sample a cornucopia of seasonal, New England favorites while you mingle with colleagues, interact with awesome exhibits, participate in disco-inspired live science, and gaze over the iconic Hartford City skyline. You’ll Love the Nightlife at CSC as we extend the party outside to the plaza where you can Get Down with more food, fun, and exceptional science. By night’s end You Should Be Dancing to the tunes of our own Funkytown’s DJ right up until the Last Dance. It’s an experience not to be missed! For guests ages 21+. Preregistration required. Event fee: $12 (supports the ASTC Diversity and Leadership Development Fellows program).